FAMILY LAW ATTORNEY | YOU ARE NOT HELPLESS! Fresno Attorney Kenneth Cavin has been practicing law since 1993 and is committed to providing you the best Family Law service possible. You are not helpless, call us today and set your appointment to meet Mr. Cavin and discuss your case. Mr. Cavin has over 25 years of experience in Family Law in the Fresno and Central Valley area. He and his staff are knowledgable about the Judges, Commissioners, Court clerks and administrators. An out of town lawyer can read our Court's Local Rules, but is not truly familiar with all of the Local Rules unless he practices here weekly. Moreover, many Judges and Commissioners have individual rules and practices that are known only by having frequent and continuing contact with them. You never want to be unpleasantly surprised in Court. LOCAL EXPERIENCE IS A MUST. Our fees are affordable, and we offer flexible payment arrangements. Our staff works hard to resolve your matter efficiently, in a way that saves you money. And if you want to help, you can reduce your own fees! 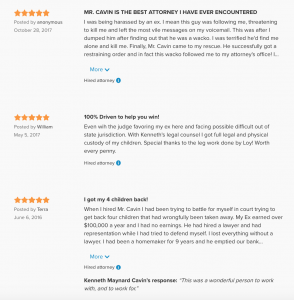 Mr. Cavin and his highly trained and experienced staff focus on Family Law and care deeply about our clients. This reflects in the attention to detail and in the results they achieve for their clients. Our Fresno Family Law Attorney and staff make themselves accessible to our clients. Our phones are answered by a live person from 8:30 am to 4:00 pm, Monday through Friday (excluding Court holidays). Messages can be left 24 hours a day, seven days a week. In emergency circumstances, Mr. Cavin works nights and weekends, and can be available by telephone at his home office. This is something few experienced attorneys are willing to do. We are not overspecialized. Family Law conflicts sometimes lead to Restraining Orders, to Juvenile Court or to Criminal Charges. Some attorney's offices are so specialized they can only represent you in the Family Court. Mr. Cavin has over 25 years of experience in many areas of law. You can hire one attorney to handle several types of cases. Why hire two attorneys at twice the price when one can handle your needs?